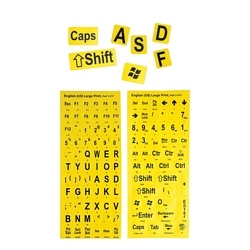 Rejuvenate or upgrade your keyboard with extra-durable permanent keyboard stickers. Printed on Lexan polycarbonate resin thermoplastic, made with 3M Adhesive 200MP, and only 2.3 mils thick (0.06mm), the stickers will adhere tenaciously to acrylic keyboard keys and won't rub off. Keyboard not included. Pros: Keep your current keyboard. Stick these on and see a world of difference. 0 out of 1 find this review helpful.